Soundside Bungalow est une maison de vacances de 1300 pieds carrés récemment construit est situé sur l'île Cedar Beach. Regardant Pamlico Sound et à côté du ferry Cedar Island; Soundside Bungalow vous offre un lieu de vacances pittoresque et isolé loin de l'agitation de votre vie quotidienne. service complet cuisine avec appareils en acier inoxydable; cuisinière à gaz, micro-ondes, réfrigérateur, lave-vaisselle, cafetière, grille-pain, assiettes, couverts, beaucoup de pots et des casseroles. Buanderie avec laveuse et sécheuse et planche à repasser avec fer à repasser. The house was perfectly appointed with everything we needed and then some. The beach was quiet and great for our small kids to explore and watch the ferry. We can't wait to come back again! The shore cabin is beautifully appointed and immediately feels like home. Walking the beach, both in front of the cabin and north of the ferry, is serene and beautiful. The ferry departures and arrivals mark the only time you hear anything other than the birds and shore. A special treat are the numerous martin homes and, at this time of year, all the birds were sitting on eggs, so it was busy. We had a wonderful time in Cedar Island. The house was perfect for our family. We just want to say we had a fabulous stay. We had everything we could need, and despite a day of bad weather we very much enjoyed our restful long weekend. Our little Schnauzers loved the beach, and the large porch! Thank you so much! We are so extremely happy that you enjoyed your stay. Hope you can return one day soon! If you like the beach, but want to get away from the typical hustle and bustle, this is your place. The house was very comfortable for 5 adults and 3 small children. The kitchen had all the essentials (large fridge was nice), but be sure to bring your groceries before you get here (there is a limited selection at the gas station). The view from the porch is spectacular, with sunrise and sunsets, and you have a constant view of the water over the sand dunes...and the kids loved watching the ferrys come in and out. The water on the beach is shallow (basically ankle to knee-deep everywhere) which was an endless water playground for my small children. If you want to take long hikes on uninhabited stretches of beach, head west, or head east (the other side of the ferry) to see the wild beach ponies. We brought our boat to fish with the kids, but they had just as much fun cast netting in the shallow tide pools. This place would be awesome for a kayaker. You might struggle getting a cell phone signal here, but sometimes that's a good thing! We had a great time here! The house has a great design with perfect functionality! Especially for little kids; our son is almost 2 and it was easy to cook, relax and keep an eye on him. He LOVED watching the ferry come and go! The porch and beach are simply blissful! We saw blue crab, small fish, and hermit crabs in the shallow water! At night you can see all the stars and we saw a few planets too! 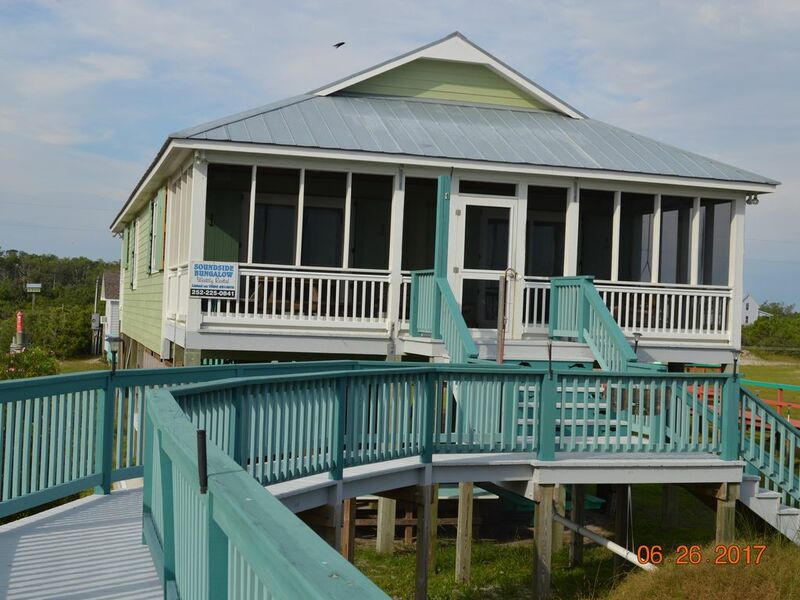 We loved the remoteness and serenity of Cedar Island at your home! Thank you! Can't wait to come again! Can not express how happy we are that you enjoyed your stay! Hope to see you again!! Cedar Island est un petit village tranquille de la pêche commerciale; avec une abondance de l'eau et de sable. Vous pouvez choisir de s'asseoir sur la plage et se détendre ou de prendre un ferry à Ocracoke. Si vous êtes dans l'humeur pour quelque chose de différent, vous pouvez conduire en Beaufort et profiter des boutiques, des restaurants et des attractions locales. August 28, 2017 through April 2018 3 night minimum stay $190.00 per night + tax+ cleaning fee; price is firm, only serious inquiries please! Over 6 people there will be an additional $25.00 charge per person. Weather conditions are not controlled by the owner!